The opportunities presented by a destination wedding are endless, as demonstrated by Taryn and Chris’ incredible wedding last February at Dreams Villamagna Nuevo Vallarta Resort & Spa. According to bride Taryn, “We shocked a lot of people when we said we had 105 people attending our destination wedding but it just shows how good of friends and family we really have and we truly feel blessed.” The couple combined visually stunning elements from the groom’s Punjabi heritage to create a multicultural affair that was truly unique. We couldn’t have felt more honored to host Taryn and Chris and all their friends and family for this spectacular event! Are you considering a destination wedding? Would you like to begin life together with the one you love surrounded by sparkling waters, breezy palm trees and pristine sandy beaches? 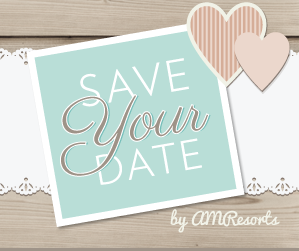 Make your wedding dreams come true; Save Your Date with Dreams Resorts & Spas! Click here to discover which resort fits your wedding style, see testimonials and photo galleries of real weddings at Dreams Resorts & Spas and book your big day. Plus, if you book five rooms for your destination wedding you’ll receive the sixth room free, and receive one complimentary room upgrade for every ten rooms booked! This entry was posted in Dreams Resorts & Spas, Dreams Villamagna and tagged all-inclusive, AMResorts, beach weddings, Destination Wedding, Dreams resorts, dreams villamagna nuevo vallarta, Save Your Date, wedding promotion, Wedding Wednesday. Bookmark the permalink. ← It’s Whale Shark Season: Dive at Dreams Puerto Aventuras!